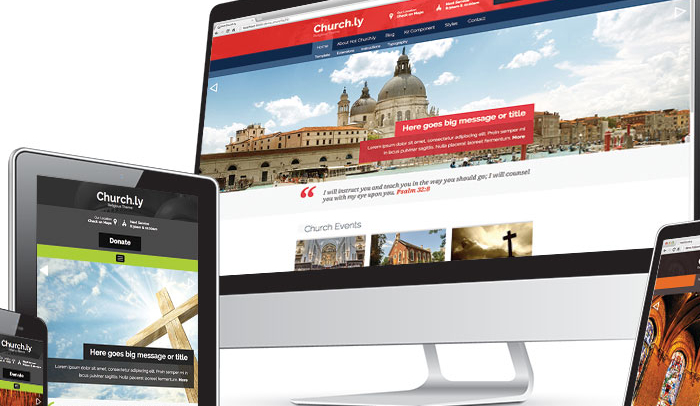 In order to reach out to their community and the world at large, churches are creating an effective web presence thanks to the Joomla templates that are available today. The very best template designs will help a church tell potential worshipers what their beliefs happen to be, offer regular members the chance to download sermons or services, and provide the church with a medium to offer their faith perspective to the world. Here are some of the very best that are available right now. Using the really good Sparky Framework, Hot Church as three styles that are pre-defined that offer churches different backgrounds and font colors. 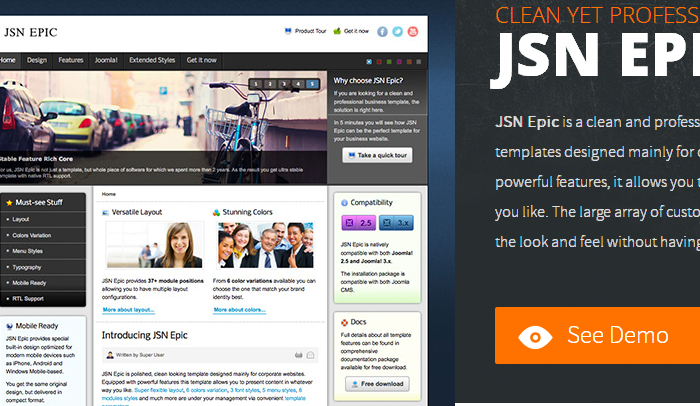 The graphics dominate the pages, creating an attractive user interface that encourages people to explore the website. It also works very well across all mobile platforms and devices, so anyone can pull up the site in a pinch to check on directions to the church or service times. With deep menu systems and dropdown panes, an unlimited number of module positions can be added anywhere within the template. Although it isn’t necessarily a dedicated church template, Epic is based off of the Warp Framework and is a very elegant, clean site. 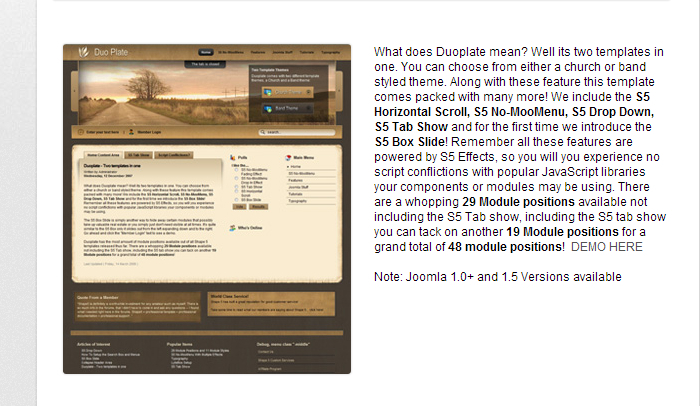 The menu options are very attractive and the sliding framework is fluid and interactive. Integrating social media is really easy to do and there are a lot of ways to help people get connected with your church. There are different color formats available as well, so you can have a cool or warm visual presence based on your personal preference. 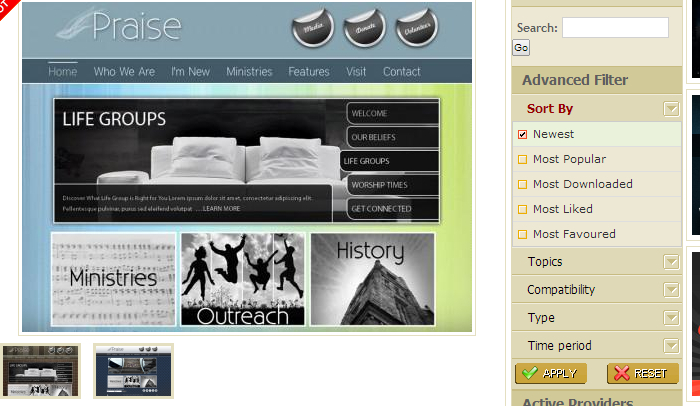 If you’re looking for a visually stunning template for your church, then you can’t go wrong with the Praise template. Using the right-hand sliding menus that are interactive, there are also ways to get to interior pages through visual block menus that invite people to click on them based on their preferences. The design is incredibly responsive and there is also rapid content that is included free with the template so that the site can be up and running in just a couple hours max. Incorporating warm backgrounds and relaxing colors, this Joomla church template is designed to help put the information people need right in front of them. 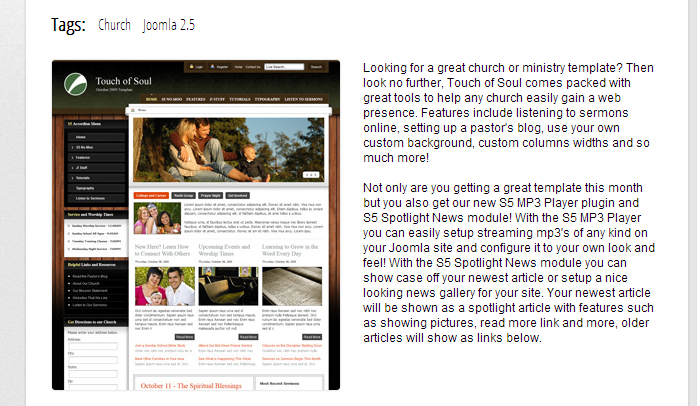 Upcoming events, worship times, and places to include online sermons are all part of the package. You can also use your own custom backgrounds if you wish, chance the width of the columns, and include a pastor’s blog if wanted as well. You can event stream MP3′s of any kind on the template, letting visitors listen to your worship team’s original compositions. If you’re looking for something that doesn’t have any bells or whistles, then this is the Joomla church template for you. It’s multifunctional and offers menus that can be jam-packed full of information. It allows for customized polls as well, membership log-ins, and plenty of compatibility so that anyone can access the site at any time to get the info they might need.